The screenwriter and director Wolfgang Kohlhaase talks about his models, successful dialogue and what makes a good story. Mr Kohlhaase, can you recall the moment when you became infected by the cinema? Cinema was part of my childhood. Admission cost only 40 pfennig, but I got that only every two weeks. It must have been in the midst of the war; I saw films like Romanze in Moll (Romance in a Minor Key) by Helmut Käutner. A good film, and I still remember that Marianne Hoppe, who played the main character, made a quiet but powerful impression on me. In the 1950s, together with the director Gerhard Klein, you brought a new realism to the East German cinema, which was strongly oriented to Italian neo-realism. What fascinated you in Vittorio de Sica’s “The Bicycle Thief” and Rossellini’s “Rome, Open City”? For me the acquaintance with Italian neo-realism was very helpful. I’d just begun working at DEFA and was trying to imagine if and how I could make films. Until then I’d thought that films were people in costumes and mounted on horses, on very high horses. In the films of the neo-realists I saw for the first time stories just like ours at home. That was encouraging. At the same time these were very big shoes, in which I didn’t fit. In 1957, with Gerhard Klein, you shot “Berlin – Ecke Schönhauser” (Berlin – Schönhauser Corner). Was it clear from the start that the film would play in Berlin, as did then subsequently many other of your films? Yes, Klein came from Berlin, I came from Berlin, Berlin was Berlin. There was this motley reality of East and West, there was adventure and criminality. And since the neo-realists also largely filmed in big cities, we said to ourselves: “Sure! Berlin’s as good as Rome”. The neo-realists also spared me from taking the sort of dogmatic Soviet cult cinema of the late Stalinist period as a model. Back then I knew only that I didn’t want to make that kind of films. In an interview you once said that the director Andreas Dresen and you came from a “similar poetic province”. Is that for you a requirement for collaborating with other directors? It’s certainly important that you have or perhaps discover a common poetics. It starts with your finding similar films bad, because you know what you don’t want to do. If there’s a range of ten points on some matter, then you should agree on at least eight. The other two then can remain open; it’ll still be difficult enough. Your films are distinguished by great dialogue. In “Solo Sunny” from 1980, Sunny is lying in bed with her boyfriend, the philosophy grad Ralph. Sunny looks at his feet, which are protruding from the cover, and says: “Your feet look so satisfied”. He then: “How can feet look satisfied?” Sunny: “But they do”. A moment that is both sad and funny. I’d heard the sentence and noted it to use to show strangeness, because the sentence is so puzzling. Because just then Sunny moves away from him and she knows: there’s something in me you can’t understand. People whose feet look satisfied can’t understand me. If she had said “You always get on very well in life”, it wouldn’t be the same. So you got this dialogue by eavesdropping? Yes. The art and the craft then consist in the sentences occurring to you again when you need them. You’re being very modest, because the dialogue is very well designed. Each of your characters has a stance, and they are always more than they say. There is dialogue in which the characters always know their feelings and can express them. In reality, language also exists in order to conceal thoughts. Good dialogue isn’t constantly explaining the situation. Dialogue must have gaps, say everything but not actually utter everything. Name one of your favourite films? The films that I like are the best-known ones: Ich war neunzehn (I Was Nineteen), Der Aufenthalt (The Stay), Solo Sunny, Berlin – Ecke Schönhauser (Berlin – Schönhauser Corner), Sommer vorm Balkon (Summer in Berlin). But there’s also a film which not many people know, but which the few who do know it love: Der nackte Mann auf dem Sportplatz (The Naked Man on the Athletic Field). The film didn’t really work in the cinema, but it’s close to my heart – because of its particular form, because of the memory of the time when we made it, and because of the people with whom we made it. None of these films was modish and so today perhaps they haven’t become outmoded. You can tell a simple story in a complicated way, and you can tell a complicated story in a simple way. But best of all, it sometimes seems to me, is to tell a simple story in a simple way. Many films tell only what they are literally about. You view a murderous shooting and then drink a beer, because the film demands nothing more from you than to be diverted. But a good story also directs you to something. Sometimes a good story in the movies is smarter than the people who make the film. It’s what you always dream about: that you catch the feeling of life at the moment. That’s why you make films. “The great themes, which recur again and again, are love, death and the weather”, you once said. Will it stay that way? Now as then, I feel close to a kind of cinema that has to do with everyday life, with the splendid and accidental in life, with the apparently little stories in which a bigger message lurks. And with films that don’t lose sight of the big story – by which I don’t mean political problem films. To make as film with a political stance is something different from making a political film. I’m interested in films that achieve an awareness of the state of public affairs and treat it. So when can we expect the next Kohlhaase movie? I’m older now. That doesn’t change the seriousness of the engagement with my profession, but it shifts the urgency a bit. I don’t have to make the same effort to keep my hand in as younger people do. If something occurs to me or if someone asks for me, well, that’s luck. 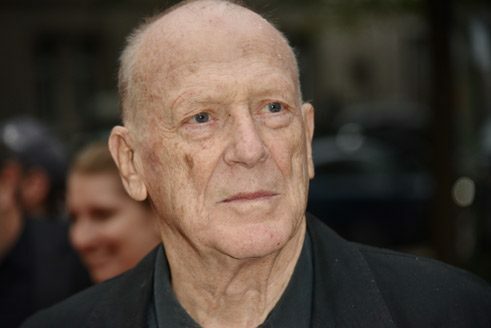 The screenwriter, director and writer Wolfgang Kohlhaase was born in Berlin in 1931. He has enjoyed long-standing collaborations with the directors Gerhard Klein (Berlin – Ecke Schönhauser, Der Fall Gleiwitz), Konrad Wolf (Ich war neunzehn, Solo Sunny) and Andreas Dresen, for whom he wrote, among others scripts, the screenplays for Sommer vorm Balkon (Summer in Berlin) and Als wir träumten (As We Were Dreaming). For his work as a screenwriter he has received numerous national and international awards. On 13 March 2016 Wolfgang Kohlhaase will be 85-years-old. Madeleine Prahs conducted the interview. She is a writer and lives in Leipzig. This interview was first published in a longer version in the Leipzig city magazine “Kreuzer”.